William Bond "Billy" Moore (1821 - 1891) built the first store building in what was to become the town of Mooresville. Built in the decade of the 1840s, it was a log structure and was situated near the present (2014) intersection of Main and Cherry Streets. No remains of this building are known to exist. Mr. Moore also built the second store in town, pictured below. Constructed in 1859, the new building was presented to Billy's daughter Mary Ellen Moore (1844 - 1932) and her husband Shelton Brock (1837 - 1863) as a wedding gift. Shelton Brock, first postmaster and the second business owner in Mooresville, used this building as his postoffice and store. The building was located on the north end of Main Street, on the west side, opposite the depot. On December 12, 1863, Shelton A. Brock and Jerome Bloom were murdered in this store by a band of four rebel bushwhackers led by Jim Nave of Jackson Township. Bloom was a bachelor of middle age, a member of the Union militia, and had lived near Breckenridge; at the time, Bloom was employed by Brock to do some carpenter work. Both Brock and Bloom were Kentuckians and both were staunch Unionists. There were no militia near and at about 3 p.m., the four bushwhackers, Jim Nave, Jr., Nicholas Weldon, William Love and William Turner suddenly made their appearance at Mr. Brock's store. Dismounting, three of them entered, leaving Nick Weldon to hold the horses of the party. There were in the store besides Brock and Bloom, Mr. Ammi Lawson and Mr. A. T. Kirtley. The brigands entered carelessly and spent a few seconds in conversation, when Nave drew his revolver and shot down Bloom. Mr. Brock was behind the counter and catching up a gun that stood by him fired at Nave, but missed his mark. Instantly, Bill Turner fired and shot down Brock. The citizens (Lawson and Kirtley) were kept under guard and the robbers then plundered the store of whatever they wanted, and they seemed to want a great deal. Brock's watch was taken from his body and was worn by Turner. The robbers left at their leisure, riding off first to the westward then turning north. The alarm was given and some militia and citizens came in and organized a pursuing party, but the weather was very foggy and the night too dark to accomplish anything. Nave and his party stole some fresh horses, passed through the Weldon neighborhood north of Breckenridge and made their escape to Illinois. The Livingston County probate judge ordered an inventory of Shelton Brock's estate. The total value of goods in the store and warehouse was assessed at $1,355.65, a significant sum in Civil War days. The next occupant was James Glenn (1827 - 1884). Mr. Glenn was postmaster and ran a general store in this building. He also sold farm machinery from another location in town. Gustavus A. "Gus" Bernard owned and operated a flour and feed store in this building from 1884 until about 1890 when he expanded his merchandise to include groceries anf dry goods. Mr Bernard retired in 1902. Rev. 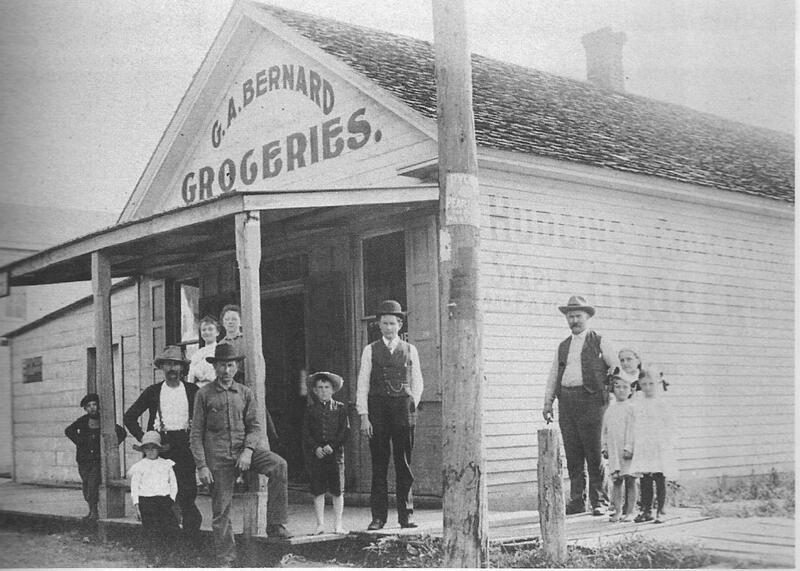 Thomas G. Petree (1856 - 1933) bought this store and its contents in 1902, remaining in this location until about 1914. The next tenants, starting about 1914, were Gill Hudgins and his brother-in-law, Jim Comstock. The photo above was taken about 1914. Mr. Hudgins is at the right with the three childten; Mr. Comstock is near the center, in his trademark derby hat. Gill Hudgins left the old building before 1917 when he and his new business partner, Julian Buford Rockhold (1887 - 1918) set up shop several lots south, in the brick building just north of the two-story store on Main Street. This partnership ended with the death of Mr. Rockhold in the influenza epidemic of 1918. Mrs. Charity Belle Boon (1865 - 1938), wife of Ammon Walter Boone, ran a restaurant in this building from about 1918 to about 1930. Sam Eller (1903 - 1980) and family lived here for a short time. A man ran a mill here. It was powered by a large electric motor, with large belts occupying much of the floor space. Few people knew his name but he was nicknamed Kickapoo owing to his Oklahoma roots. The family of Elston H. "Bud" Stout lived here during the summer of 1948 for the benefit of sons Ronnie and Jimmy. Bud commuted on weekends from Kansas City where he was employed. Mrs. Martha Hamilton (1914 - ) operated a pool hall, complete with juke box and dance floor, in this old building. Her establishment was very popular on Saturday nights. The building, owned by James Henry "Jim" Roberts, was destroyed by fire on May 20, 1956. History of Caldwell and Livingston Counties (1886). The Chillicothe Constitution-Tribune (May 21, 1956).